This post is to talk about types of configurations. How to configure distributed system and cache properties for your vFabric GemFire installation. For your applications, it provides guidance for writing code to manage your cache and distributed system connection, data regions, and data entries, including custom classes. To work with your vFabric GemFire applications, you use a combination of configuration files and application code. Distributed system members are programs that connect to a vFabric GemFire distributed system. You configure members to belong to a single distributed system, and you can optionally configure them to be clients or servers to members in other distributed systems, and to communicate with other distributed systems. GemFire provides a default distributed system configuration, for out-of-the-box systems. To use non-default configurations and to fine-tune your member communication, you will customize your system configuration. You can use a mix of various options for customizing your distributed system configuration. To populate your vFabric GemFire cache and fine-tune its storage and distribution behavior, you need to define cached data regions and provide custom configuration for the cache and regions. For many vFabric GemFire discussions, you need to understand the difference between local and remote membership and caching. The vFabric GemFire cache is the entry point to GemFire caching management. GemFire provides different APIs and XML configuration models to support the behaviors of different members. The region is the core building block of the vFabric GemFire distributed system. All cached data is organized into data regions and you do all of your data puts, gets, and querying activities against them. GemFire provides different APIs and XML configuration models to support configuration and management of your data regions. A simple and fast way to create a data region in the vFabric GemFire cache is to use the gfsh command-line tool. A common way to create a data region in the vFabric GemFire cache is through cache.xml declarations. You can use the GemFire caching API to create regions in your cache after startup. For run-time region creation, you need to use the API. To get the full range of vFabric GemFire capabilities for your cached data regions, follow Gem Fire's region naming guidelines. The data entry is the key/value pair where you store your data. You can manage your entries individually and in batches. To use domain objects for your entry values and keys, you need to follow vFabric GemFire requirements for data storage and distribution. Imagine sitting down at work, plopping a mobile device on the desk and having it wirelessly charge itself while, at the same time, synchronizing new data to your PC. In that world, one could also wirelessly charge a phone set on a car's dashboard or armrest while it plays music through the speakers, and never have to search for the one open electrical outlet at the coffee shop or airport. That world may not be too far off for the masses of smartphone, tablet and other mobile device users. With the launch of the Windows Phone 8-based Lumia 920 smartphone last week, embedded wireless charging is hitting the U.S. mainstream. The built-in wireless charging capabilities offered in the Nokia 920 doesn't require that widgets be plugged into the USB port of a smartphone in order to charge it from a magnetic induction power pad. That's the typical wireless charging process today. The Lumia 920 only has to be laid on a power pad to be charged. William Stofega, an IDC mobile device analyst, said wireless charging pad business is currently dominated by Duracell's Powermat technology, which is based on magnetic induction technology, one of two forms of wireless charging. But that choice is likely to change soon, thanks in part to the Wireless Power Consortium's Qi (pronounced "chee") open wireless charging standard, Stofega said. Already, some products from 120 companies are certified as compliant with the Qi standard. The certified products run the gamut, from the LG Optimus LTE2 andPanasonic Eluga smartphones, to charging pads, gaming controllers, Blu-ray Disc recorders, smartphone docking speakers, automobile phone chargers, alarm clocks, battery packs and charging modules that can be installed in tabletops and furniture. Analysts note, though, that there are some slight differences in the Qi-compliant wireless charging products being developed today. Some use magnetic induction charging techniques, which require that the mobile device be in contact with a charging device. Others use resonance charging, which allows a mobile device to be placed near the power source for charging. Magnetic induction charging uses two coils: a transmitter coil and a receiver coil. Alternating current in the transmitter coil generates a magnetic field, which induces a voltage in the receiver coil. In contrast, resonance charging offers wireless AC transmission to a device at a distance ranging from 5mm to 40 millimeters (about 1.5-in) from the power source. Resonance charging is based on the same transmitter/receiver coil technology as magnetic induction, but it transmits the power at a greater distance. So, for example, a mobile device could be charged when laid next to a laptop with resonance charging capability. To date, there are no resonance-charging devices available, according to Stofega. But that may soon change as Intel ramps up its wireless chip development. Intel Labs first demonstrated in 2008 technology that could wirelessly charge mobile devices. Intel's Wireless Charging Technology (WCT) would let a user charge a smartphone wirelessly from a notebook PC. Intel late last monthannounced a partnership with Integrated Device Technology Corp. (IDT) to develop chipsets for WCT products. Products using the chipsets are expected to come out in 2013, Intel said. Some reports have said the next Apple MacBook laptop will have wireless charging capability based on the Intel-IDT technology. "[The jointly developed] product is important and new because it leads to a solution that isn't limited to inductive charging and 'smartphone on a charging mat' usage," Intel spokesman Dan Snyder wrote in a blog post. "Although we are not yet giving out timeframes for consumer products with WCT enabled, IDT has stated they will be delivering their full chipset solution for reference design work in early 2013," Snyder added. "The ecosystem is already excited about this technology so we assume there will be a race to the finish line for sure." Currently, wireless chargers can supply up to 5 watts of power, the equivalent of most USB-style chargers available today. By comparison, a USB port on a laptop, which shares it's bandwidth with data I/O, offers only 2.5 watts of power. Some of the latest USB chargers, however, offer fast charging with 10 watts of power. The Wireless Power Consortium is already working to extend its Qi specification to allow 10 watt power charging, said Menno Treffers, chairman of WPC. In Japan, where the wireless charging market is more mature, several companies have put out combination products, where a single system can be used to charge a device while transferring data. For example, TDK this week released a Bluetooth enabled speaker that also uses magnetic induction to power mobile phones while also playing music stored on them. Treffers said automobile manufacturers can be expected to add wireless charging technology to cars. "The automobile industry needs to start now because there's a long [development] lead time," Treffers said. "If you want wireless charging in your car this year, you would have had to have started production last year." The Wireless Power Consortium published the version 1.1 of the Qi open wireless charging standard in March, 2012. Laptops and charging devices supporting the standard can charge mobile devices that are placed on, or near them using either magnetic induction or resonance charging. According to WPC, there are 8.5 million Qi capable devices sold worldwide. The largest market for wireless charging is Japan, where it's almost impossible to purchase a mobile phone without the capability embedded in it, Treffers said. Gartner analyst Ken Dulaney called the Qi standard "a strong, and sorely needed means for wireless charging." Though several key vendors, including Apple and Samsung, have yet to announce support for the Qi Standard, Dulaney believes it already has the necessary backing to move forward. According to Intel, an Ultrabook user could soon simply use WCT detection software on a PC to charge a nearby smartphone. Coupling takes place between the two devices and energy begins to seamlessly and wirelessly flow from the Ultrabook to the smartphone. "Within an hour, you have recharged your smartphone sufficiently to make it through the afternoon. No more wires or chargers," Intel said. The Qi specification is also aimed at technology used automotive systems to avoid interference with wireless systems like Bluetooth. The Qi standard also is expected to be adopted by wireless payment systems, combining powering and data transfer. "The technology has improved to the point where it takes just about as long to charge your device wirelessly as it does with a cable," Dulaney said. "And combined with Bluetooth you really could see a day where you could give up the cables in your bag." 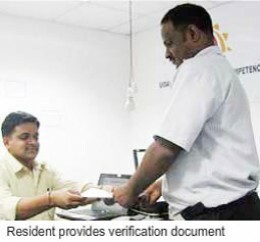 With the mission of providing each and every resident of India a unique identification the ambitious project of UIDAI (Unique Identification Authority of India) was set in February 2009 with its chairman being former IT czar Nandan Nilekani. The association of Mr. Nandan is very important in this project as the government wanted to send the right message upfront that they are very serious about the project, and also it required a visionary leader such as him who is well-versed with the overall Information Technology scenario, which is an essential part of collecting and safely storing information of more than a billion citizens. 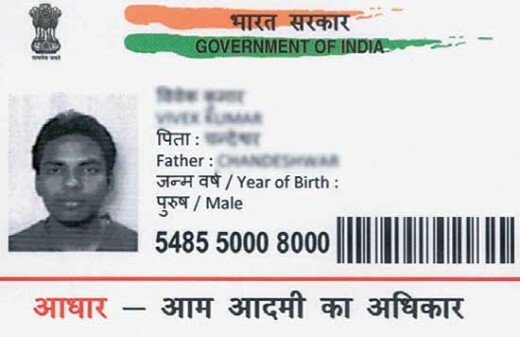 To be frank, India is far too late in the scene of providing unique ID's to all of its citizen. Countries like Belgium, Bulgaria, and Turkey have made it compulsory for their citizens to get the National Identification numbers at birth. Parents must get their National IDs for their children immediately after their birth. Whereas in United States to some extent the Social Security Number can be associated with the national identities. SSN is not compulsory but over the years for all banking and taxation purposes SSN's are mandatory. So, in a way it can be dubbed as unique identity in United States. There are some what 63 other nations in the world where some kind of UID's are already in place and more and more countries through out the world are starting to issue some kind of national identities to their citizens and for India it is a clear case of better late than never. The closest our government came to provide a unique ID to every citizen is the PAN card number which every citizen can apply for unlike the Voter ID card which can only be applied when one reaches the age of 18. But we all know how much bad is the status of PAN cards; we constantly hear about various scams or where people can easily get more than one PAN number for them. It is true that several other countries have some or the other national identity number but no other country in the world has ever started such an operation which with the ambition of enrolling more than a billion individuals. Each and every individual will get a 12-digit unique ID number which will be helpful for any citizen to easily migrate to other places without worrying to get fresh or to renew existing identities. It will also be a first of its kind in a way because that it will store biometric and demographic data of the applicant, which will involve iris and fingerprint scan and photograph. No other country in the world has sought to collect both the iris and fingerprint of its citizens. Collection of all this data will be done with top-quality modern tech devices and the data will be stored in an economical way in a centralized location so that agencies from the government as well as private agencies can get the information accessed. But only a "Yes" or "No"; it won't provide each and every information of you to be exploited. Also, never before any government in the world has ever spent such amount of money or is planning to spent such huge amounts of money. At the time of writing a total of 2000 Crore rupees has been allotted to the agency for its operation. According to various reports the project could cost anywhere between 7 billion to 33 billion rupees. It is not just another card for a specific purpose. In the larger context it can be used in the future for many purposes. Aadhar can be applied for every one; even for a new born baby or for a 90 year old person. For children below the age of 5 there won't be collection of any biometric information such as iris or fingerprint scan. Their UID will be linked with their parents UID and once they turn 5 they will have to update their ID's with biometric information. Biometrics will have to be updated once again when they turn 15. As for differently abled people who cannot provide their biometric information their will be other markers that will be used instead of biometric information. It is not like other cards where the holder of the card is a citizen of India, it is for every resident whether he may be an Indian or foreigner (though for foreigners they have still not started to issue cards). It won't collect your information related to your caste etc. But it will collect your biometric and demographic data. UID's are not mandatory and it is not necessary for every individual to have it. But as experts suggest that invariably it will be required by many government and private agencies in the time to come. So, it is better that you get enrolled. Yes, it is for every individual irrespective of their existing documentation. That is, if a person does not have any previous documentation then he/she can also get their Aadhar. (For more information on this see the 2nd point of "How to Get Aadhar Card Anywhere in India" section on this page). Each and every individual is allowed to get only one Aadhar card or so as to say that he/she will not be able to get more than one UID. This is particularly true because it records the biometric information of the applicants. So, getting a fake Aadhar card is next to impossible until we come across a big scam. It is a general misconception that in the times to come UID will replace all other ID's that we use now. It will just make easier for people to get their unique identification anywhere in India. Aadhar cards won't replace your driver's license nor it will render your Voter ID useless. The information that you will share will not be available to use by government agencies or private agencies to profile you instead it will just provide a cursory yes or no identification. That is your information will not be available for use of others. Do you think Aadhar will be successful? Yes, the government is doing the right thing to provide every citizen a unique identification. No, there is too much suspicion over the project. May be, but I just want my Aadhar card so that I don't have any problems later. Every resident will have a Aadhar card with a unique number, a 12 digit number which will serve its holder a proof of identity and proof of address all over India. The 12-digit number displayed on it is your unique ID number which in the system will be a 16-digit number with four digits as a prefix digit. The rest four digit will not be displayed on your card and it is only for the usage of the database and the servers. 1) Any resident can walk in to the nearest enrollment center and get themselves enrolled for an Aadhar card. Nearly every city or town will have an enrollment center or most probably the nearest major town or village will have an enrollment center. Just visit the above link to find your nearest UID center in Maharashtra. You can search by your village, town or your district. On the right side there is also a search box where you can enter your pin code to find the nearest center. Takes you to a online spreadsheet from where you can easily search and find the nearest center. Online spreadsheet where you will find the nearest UID center in Madhya Pradesh. Download the spreadsheet to find the nearest center in Chandigarh area. 2) Walk-in with your identity proof for address (PoA) and proof of identity (PoI) documents. The UIDAI has in place a system called Indroducer System. If the head of your family has any documentation then he/she can first enroll and then after getting their card he/she can introduce you as a family member. The second method is where a introducer who is appointed by the registrars or directly by the authority can introduce people who don't have such identification documents. This is specifically helpful for poor people who until now didn't had any such documents. There is a large section of people in remote areas where people don't even can produce a proof of address or proof of identity. This system is primarily helpful for those. When you reach the nearest enrollment center with your documents of identity and address proof, keep in mind that you don't require a hard-copy of your photograph, the enrollment officer will himself take your photo using a webcam and that photo will be used in your UID card. The adjacent table gives a list of information that you should provide in the application form. The form only needs basic information details such as name, address, parents name, contact details and your biometric information which will be collected right at the enrollment center itself, so you need not worry about the biometric information. Just get your documents Xerox and original along with the application form filled and process will not take much of your time, maybe 30 minutes or so. 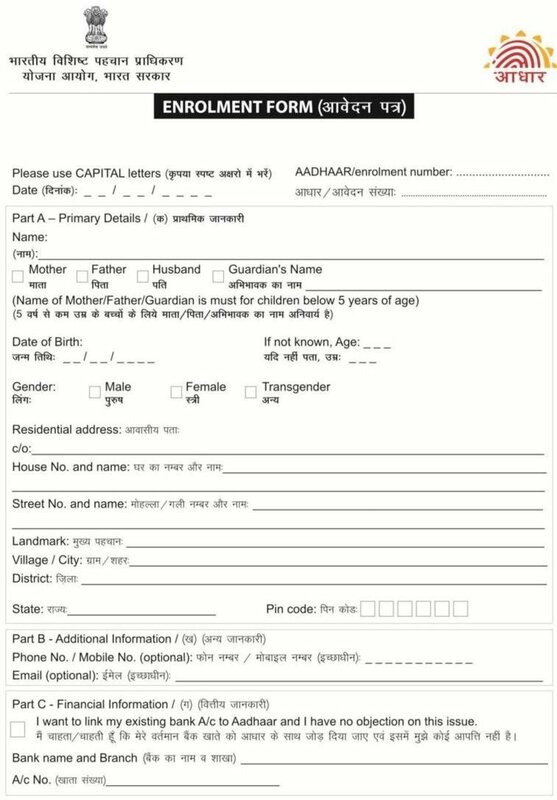 You can download the aadhar application form from the link given on the right side of this text and print it or take a xerox of it so as other members of your family can use the form. 3) After filing the form with the necessary details just hand it over to the officer who will then take your biometric information and record it. 4) The officer will also ask for your verification of the data which you or any member of your family can do on your behalf. You have to see that every information of yours have been entered correctly. 5) You will get an acknowledgement slip and a temporary enrollment number from which you can check the status of your application. 6) That's it you are now done with it. The documents that you have given will be verified and your Aadhar card will land up at your doorstep in anywhere between 60 to 90 days to you by post. You have the option to check the status of your Aadhar card online and get details as to in which stage is your application. Just enter the above details and the captcha code to get the details of your application. The above information will be on your receipt which you get when you applied. You can also check the status of your application offline by calling the contact center. Besides you can also register your complaints and get more information of the project. By calling the above toll-free number you can check the status or register your complaints, if any. Fax number if you want to send some documents in between the process of your application. Fax number will be used only in rare conditions. You can also post your letters with suggestions, complaints, grievances that you may on this address. Same goes with the email ID. So, you got your Aadhar card and found that there are some changes required. Or another scenario can be that you have changed your address or are planning to relocate somewhere else. Or for some other reasons you want to change some other information, there can be 'n' number of reasons. As the process is totally done electronically and you yourself (or some other person on your behalf) have to verify the information entered at the time of enrollment, after which the information is only verified centrally and your card may be either be issued or it may get rejected (which is rare if you have correct documents). So the chances are that your card was issued correctly but now as circumstances have changed and you would like to get your card edited or corrected. Then this may not be a good news for you because there is still not a process in place to get information in your card edited or changed. The UIDAI is constantly evolving the whole process and there will soon be a process by which you will be able make corrections in your card but also can view your own information in real-time. At this point in time there is no such procedure where you can change or edit your information in the card.